An ongoing webcomic. In space. This is it! The end of “Season 1″ of Space Corps. No worries, more comics are coming, but this is a huge milestone for us. We thought that this would be a good time to interview each other and talk about how this comic came into existence. Sort of a DVD commentary, if you will. So indulge us for a bit. BRYAN: First up, why space marines? I know when we’d first started discussing Space Corps, you’d had the concept kicking around in your brain for a good while. Why go with science fiction rather than contemporary drama, or a historical setting? I’m glad we went with sci-fi, because I love the ability to break the rules of reality when we like, and it opens up options with hyper-exaggerated characterization, but why do you think you leaned in that direction in the first place? GANNON: I wanted to do a story about space marines because so much of how the military is portrayed in fiction just hasn’t rung true to me. There are exceptions, of course, but stereotypes exist in fiction that reflect the stereotypes carried around by society at large. I wanted to hammer away at that. Plus, the interplay between authentic military culture, and fantastical creatures is something that just gets both of our imaginations cooking. It allows us to talk in metaphors, which is (hopefully) interesting to read, but at the same time allows us to smuggle real thoughts about war and sacrifice into the story. B: Digging through my emails, I found our first communications really started in November 2011 (YIKES). It’s a lot of fun to see how much enthusiasm we had flowing back and forth in those mails. Now that we’ve been working at this for about five years, what are some of the wake-up calls you think you’ve had about making comics? I think one of the big realizations for me has been the nature of creative work being a marathon, not a sprint. Especially in the situation we’re both in, with working a day job and making comics when you can, it seems even more vital to just keep putting one foot in front of the other. I know it’s got to be even a bigger challenge on your end, just because the amount of labor that goes into the art is so much greater. How do you keep the tank full? G: I don’t know if you would call it a wake-up call, but the biggest realization I had was that the industry of comics and the art form of comics aren’t the same thing. The industry is a business that uses the art form of comics to make money. It needs the art form. Conversely, the art form does not need the industry to exist. You just need people willing to take the time to do it. I think in the beginning I conflated the art form with the industry. I took portfolios to conventions looking for paid work, as if that were the most important thing. Once I realized that I really did love the art form, independent of compensation, things got a lot easier. You often hear professionals saying that they love doing what they do so much they’d do it for free. Well, with us that isn’t hypothetical! We really do it because we love it. The insight was realizing it was WORTH doing it because we love it. The art form is wonderful. The people who engage in the art form tend to be wonderful as well. As far as keeping the tank full, it’s about spreading out the work and being flexible with the deadlines. I don’t beat myself up when life gets in the way. B: Some of my favorite memories with putting Space Corps together was cooking up the characters. I remember vividly chatting with you over Facebook as we came up with Santiago and his arc. That was one of those moments when I knew we had something special. What are some of your favorite Space Corps memories? G: A favorite memory is hard to pin down. So much of it is a blur, and there is so much that I’ve enjoyed about the experience. I’ve gained a lot of respect for the Marvel Method, which is probably the biggest surprise. When you read about how it works, it sounds crazy, but in practice, it’s highly collaborative. It’s allowed for a melding of ideas that would be much harder to achieve if we took turns writing scripts instead of talking our way through the stories together. Ideas collide, spark, and spawn new ideas. B: When did you know that this story had legs? G: In terms of legs, I’m assuming you mean legs with us, not necessarily an audience. It’s hard to pick a single moment, but it was clear early on that we got along well and had fun kicking ideas back and forth. One short story turned into four and we just went from there. I have to spend so much time drawing that it’s very important that I really love the story, but also enjoy who I’m working with. If either of those don’t work, it’s going to be miserable. I mean, five years. Can you imagine how hard that would have been if the story didn’t interest us, or if we didn’t get along? B: I’ve been thinking about how Space Corps ended up as a pretty non-traditional webcomic. Webcomics seem weighted towards gag strips, and we went long form. 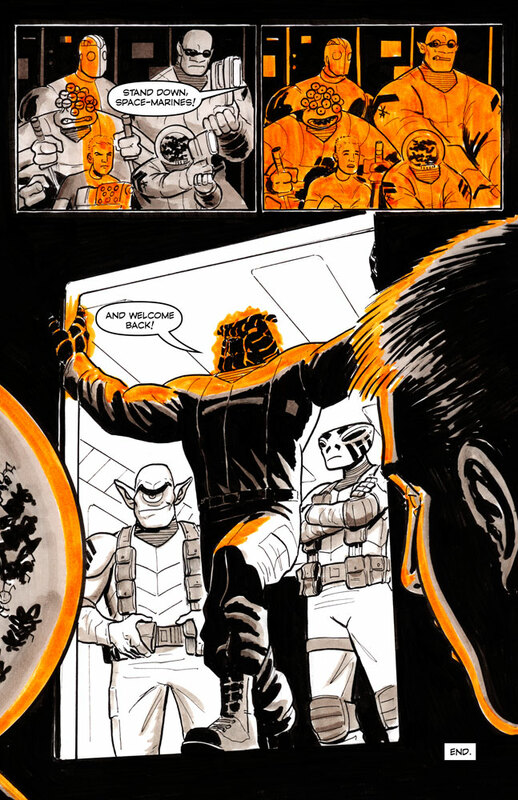 Sci-Fi comics lean towards color, we went black and white. Action comics tend to be go-go-go fast-paced, while we went with bursts of action followed by long periods of reflection. How do you think the book would have ended up differently if we’d pitched it to a traditional publisher and possible editorial interference? G: Unless a traditional publisher was willing to pay me enough to live on, I would have been fired for how long it’s taken me. Although in my defense, I did work on Past the Last Mountain with Paul Allor and Louie Joyce in the middle of Space Corps, so I’m not quite as slow as I seem. It’s hard to know how a publisher would have affected the story. There is so little money in comics for an indy comic like us, though, that it wouldn’t have been worth it to alter the story in a way we didn’t agree with if it came to that. I think I’ve said this before, but the one guarantee we have by doing this ourselves is that we get to tell the story we want to tell. I think that, even more than money, is the difference between loving working on comics or hating it. In the beginning, we dipped our toe in the pool with a short story, then very quickly found ourselves doing a cannonball into the deep-end with a six issue series. What were your expectations during those early days? B: I had two internal processes running in those early days. The first was the immediate realization that not every creative partnership works out, and if we got a good short story out of it, I’d be happy no matter what. That said, my brain couldn’t help but start fleshing out the Space Corps universe. Characters, tech, plot, and action set-pieces all started growing organically from my brain and I couldn’t stop it. It was like assembling a jigsaw puzzle from the middle out. We had our core set of main characters and I couldn’t help but keep adding pieces, with no idea where the borders were. G: That’s a good description. I had pieces of things I wanted to do, but also huge gaps to fill. It’s been great seeing how the pieces fit together, and how one idea sparks another, and another. Our method of working has made me think about how the heart of writing is less about words, and more about ideas. We’ve talked about this before, but this experience has made me think about how Stan Lee and Jack Kirby worked back in the day, and now I can now understand why it’s hard to remember who created what. I remember coming to you with an idea about the Sheg “eyeballs” joke only to have you remind me you suggested that joke a while back in a Facebook chat. I looked, and there it was. I thought that if we had a hard time keeping the origin of ideas straight in our little story, it’s easy to see how there would be conflicting accounts between Lee and Kirby. What we do is similar to the Marvel Method, but it also seems to me that we work the way a writers’ room might for a TV show, or at least how I might imagine it. I know you’ve had collaborators before. Have you ever worked this way before on a story? B: Yeah. I did improv in college, and one of the driving principles there is building on what the other person is doing. You’re always adding, never subtracting. I remember conversations we had where you’d make an off-hand comment and that would send my brain off in a radically different direction than what I’d planned. That’s collaboration, and it’s a beautiful thing. I’ve only worked this way with one other project really, and that was/is Incapabots (another comic I’m -still- trying to get off the ground). Incapabots is a comedy, and much more naturally suited to that improv style. Space Corps is such a polar opposite in so many ways. We have our humorous moments, but at its root the book is about a mortal being trying to hold onto his humanity as its being stripped from him. Not exactly SNL material. I think it helped that we diagrammed out our plot far in advance, so the improvisation had room to breath from page to page. It shouldn’t work, but it does (in my humble opinion). The Marvel Method feels more like that improvisation, like jazz. We throw the elements we want into the pot, and baby you’ve got a stew going. G: It’s funny that you bring up improv. While I’ve never done improv, (I think I read about it in Tina Fey’s book), I love the “yes, and..” principle of it and try to keep that in mind when collaborating. It seems we’re on the same page on this even though we never talked about it before. Unless my memory is bad here, which is possible. I think you’re, right though. The Marvel Method leaves the story open enough, long enough for cool things to be discovered. I don’t know about you, but it seemed to get easier as we went along. As we got to know the characters better and better there seemed to be a certain kind of story physics in play. It seems like we had a few conversations that were us just agreeing about how the characters would react in any given situation. It wasn’t about what we wanted the characters to do insomuch as it was about what we thought they would do given who they are. That’s a fun place to be with these characters. So who is your favorite character? B: Sheg. Definitely Sheg. Cthulu as an infantile private? Love it. G: Probably Hive. He’s such fun to play with. Captain Brockett? No, he is very much alive. He did cover a grenade in issue 2, but he is tough enough to take it. I’m not sure if you saw it, but I spent some time revising the first 8 pages of issue #1. I didn’t decide to use the 16 panel grid as a base grid until page 9, so I had to go in and redo them. I like them much better now as they fit in with the rest of the books. My favorite is definitely Hive, and as i’ve said before, Hive has become one of my very favorite characters ANYWHERE! That means a lot to me for you to say that. We’ll be doing a sculpted Cpl Hive resin model kit when we get around to Kickstarting issue #1, so keep a lookout. I’v been checking this everyday for the update. This is the greatest space comic I have seen in a while. I am eagerly looking forward to the next one. Keep up the good work! We’ll be switching back to some short stories for a while before we get on with the main story. So many ideas to explore! I’ll be glad when this comic gets stuff posting again! It’s so refreshing to have a take on the military that isn’t pre-packaged with an agenda. Hey mate where you gone? I just read through all of season one, and I hope you guys speed up the process of creating the next season, because this is just too good to wait on.